In the early years of the Internet, the 1993 New Yorker magazine cartoon, “On the Internet, nobody knows you are a dog”, portrayed how millions of people hiding behind a veil of anonymity can go online and enhance or reconstruct their individual identities. This happens, of course, because the Internet fosters faceless relationships. You can be anyone you want to be — even a dog — and there’s a good chance no one will find out. There’s something about an in-person contact that keeps people honest; without it people are tempted to make themselves out to be someone they’re not. Take online dating. You can look at a potential date’s picture and profile — and even carry on conversations by email, text or phone — and still not know for sure who you’ll meet in person. Today’s Internet culture reinforces the need for Certified Signing Specialists to represent themselves honestly. That’s particularly true because the document signing services industry leverages the web to contract and interact with Specialists, and it is rare for companies and Specialists to ever actually meet. The Standards of Professional Practice in Guiding Principle 8 are designed to encourage Certified Signing Specialists to present themselves accurately when promoting their business. This starts when Specialists apply to join contracting company networks. Specialists must not inflate their credentials when signing up with a company (Standard 8.1). For example, they should not misrepresent that they’ve done dozens of loan signings or handled particular types of transactions (reverse mortgages, HELOCs, purchases) when they haven’t done any. Standard 8.2 warns against the temptation to make exaggerated claims, such as “I’m always on time” and “My signings take no more than 30 minutes,” which sound great but are difficult or impossible to always back up in practice. Standards 8.3, 8.4 and 8.5 urge Specialists to use professional designations like “Certified Signing Specialist” only when they have earned them, and to comply with all requirements governing the proper use of the credential. Once an assignment has been given, Standard 8.6 provides that Certified Signing Specialists must not directly or indirectly solicit a signer for products and services other than as a Certified Signing Specialist or Notary Public. 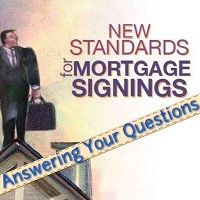 This Standard applies not just to the time when Specialists are with the signer to present loan documents, but both before and after the appointment. Borrowers are subject to a largely impersonal and faceless loan origination process. In fact, one of the most compelling value propositions Certified Signing Specialists bring to the table is that they are usually the one live human being borrowers see. This gives Specialists a huge advantage, but also places them in a position of great trust with lenders, contracting companies and borrowers. Do my claims paint a consistent picture of who I am? Do I follow through on every promise I make? Do I over-promise and under-deliver or under-promise and over-deliver? Who are you when no one’s looking? Is this the same person people see?